Jeans that are comfortable to ride in don't have to be boring. The Ariat REAL Rainstorm jean address the riders needs with the mid-rise and no-gap waistband. 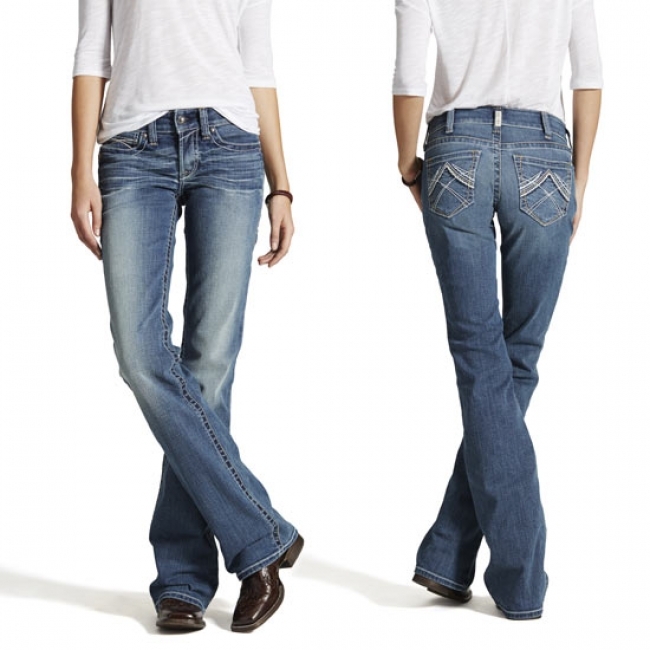 The stretch denim gives the range of motion needed from saddling up to dismounting. The flattering fit is coupled with the clean saddle-safe pocket design that turns the Ariat REAL Whipstitch jeans into great pair of women's denim. Front Rise 7 3/4" 7 1/2" 8 3/4" 8 1/2" 8 1/2"
Back Rise 13" 12 3/4" 14" 13 3/4" 13 1/4"
Waist 31 1/4" 31 1/4" 31 3/4" 31 3/4" 31 3/4"
Seat 38 1/4" 37 3/4" 38 1/4" 37 3/4" 38 3/4"
Thigh 22 1/4" 21 1/2" 22 1/4" 21 1/2" 22 3/4"
Knee 15 3/4" 15 1/4" 15 3/4" 15 1/4" 16 1/4"
Bottom Opening 17 1/2" 18" 17 1/2" 18" 18"